In a time when the status, rank and honour of the scholars of Sunnah and Salafiyyah is being maligned and attacked by callers to bid’ah and misguidance (and more-so in recent months by some misguided souls in the USA), it is appropriate that we make mention of some important narrations and scholarly sayings regarding this crucial subject. One should be in no doubt that those who revile, speak ill and belittle the scholars of Sunnah and put doubt in the hearts of the Muslims regarding them are innovators, and maybe even be innovating heretics, who wish to prevent people from understanding and following the true ‘Aqīdah and Methodology of the Salaf (read here, and here). I believe that some Salafis become deceived by these callers because they [falsely] claim attachment to the Salafi way in a similar fashion to those who preceded them from Ahlul-Bid’ah. However, one should not be deceived by mere claims because the reality of a person revolves around his practice of the Salafi Manhaj, and his attitude towards those who call to Salafiyyah, and at the head of them are the Scholars of every age and era leading back to the time of the Sahābah. This present band of callers openly declare particular scholars to be “driven by desires” whilst at the same time, “not caring” about the plight of Muslim communities in the West. Others malign Ahlus-Sunnah who quote from the books of the great Imāms of the Salaf such as Al-Barbahārī. Salafi youth should not be deceived by these plots and schemes to turn people away from the Salafi da’wah. Due to the steadfastness of the scholars and their fear of Allah, they are not scared of the blame of blamers or the accusations of the ignorant against them. They do not care if they are betrayed, opposed or abandoned. They are the followers and the inheritors of the Prophets, and they know that those who are tried and afflicted the most are the Prophets, then those who resemble them. So they remain firm upon the Truth regardless of the opposition, even when Ahlul-Haqq are few in number. So when there are numerous speakers (mostly young, ignorant and reckless), who revile the scholars and belittle their worth; accuse them of being ignorant of current affairs and the reality of Muslim communities and societies, such that the people no longer distinguish between a person of knowledge and the riff-raff who call to misguidance, it is then that they are ruined. In these times within the Western lands, this negativity towards the scholars of Salafiyyah is rampant and widespread – and these mumayyi’ūn, who [falsely] ascribe themselves to the Salafi Manhaj are more harmful to the Salafis (i.e. to Ahlus-Sunnah wal-Jamā’ah) than the open and apparent Ahlul-Bid’ah, just as Ahlul-Bid’ah are more harmful to the Muslims than the unbelievers. Sadīq Hasan Khān (rahimahullāh) said, “The saying of the Messenger, ‘They will expel from it the distortions of those who go to extremes’ means the changes made by those who go beyond bounds in the affair of the Religion. ‘Distortions’ refers to exchanging the Truth for falsehood by them changing the words [of the Revealed Texts] or by changing their meanings. 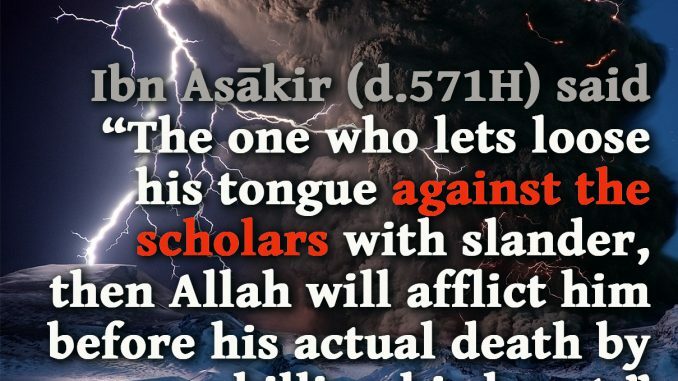 ‘The lies of the falsifiers’ means the scholars will expel the lies of the people of falsehood..” (Ad-Dīn Al-Khālis 3/261) So to attack the scholars is to harm those whom Allah has raised to preserve and guard His Religion from the people of falsehood and desires, and to block people from the Path of Allah. Abul-Qāsim Ibn ‘Asākir (d. 571H, rahimahullāh) said: “Know, my brother – may Allah guide us and you to His pleasure, and that He makes us from those who fear Him and are dutiful to Him as He deserves – that the flesh of the scholars, may Allah be merciful with them, is poison. 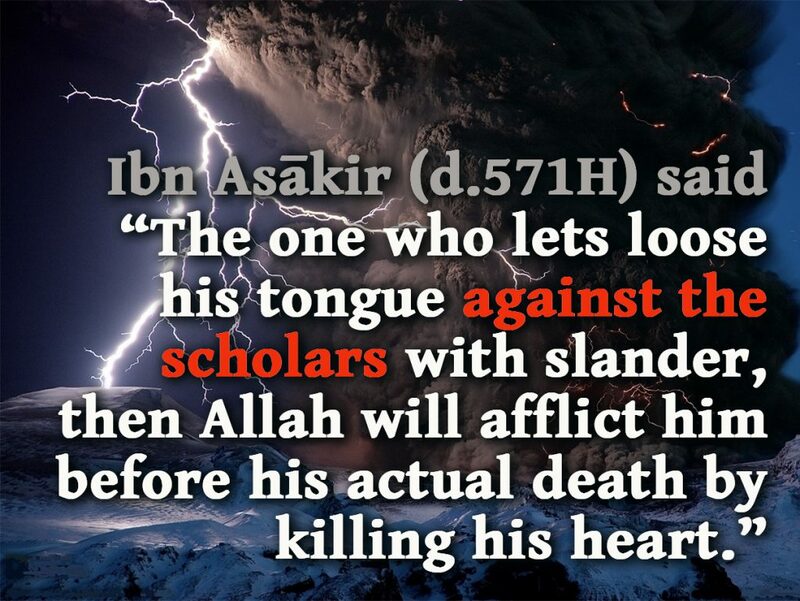 And Allah’s established way of tearing down the screen of those who attack the scholars is well-known. That is because attacking them for an affair that they innocent of is a mighty thing – and to speak of their honour with falsehood and fabrications is an evil and noxious pasture to graze upon! Ash-Shaikh Al-‘Allāmah Sālih Al-Fawzān (hafidhahullāh) commented: “The author moves on [from the Sahābah] to mention those who come after them in virtue, and they are the scholars. So the scholars of this Ummah have status and virtue after the Sahābah because they are the inheritors of the Prophets due to the saying of the Messenger, ‘The scholars are the inheritors of the Prophets’. And the intent here is the scholars of Ahlus-Sunnah wal-Jamā’ah, the people of knowledge, insight and understanding, ahlul-athar, and they are ahlul-hadīth…” (Then the shaikh quotes the statement of Ibn ‘Asākir above). Muhammad Ibn Ismā’īl Al-Bukhārī (d. 256H) said: ‘Ali Ibn Al-Madīnī said: “They are Ashābul-Hadīth.” They are the scholars as the Companion, Mu’āwiyah (radiyallāhu ‘anhu) stated in the first hadīth above. And all praise is due to Allah, the Lord of all creation.